Recent studies in neuroscience have shown that the brain has a more significant effect on the human body and its behavior than previously imagined. Aside from the obvious neurotransmitters that affect pleasure and stress, such as dopamine, a new hormone emitted by the stomach may also have a positive effect on fending off anxiety and depression. A new study published in the journal Nature Neuroscience has shown that the hormone gherlin, emitted from the stomach to signify hunger, may help fend off anxiety and depression (Lutter, 2008). Lab mice with increased levels of the hormone gherlin from subcutaneous injections, injections just under the skin behind the nape of the neck, were revealed to be more adventurous during elevated maze trials and less stressed in swim tests. 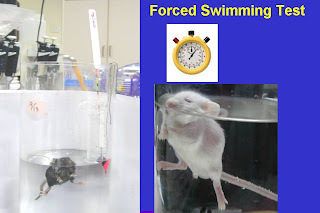 These tests are a great way to test for stress and anxiety as the swim test shows how long a mouse can swim in water before giving up and accepting defeat. The elevated maze test compares how far a mouse will walk out to the opened end of the maze to study the effects of stress. This data showed that mice with increased levels of gherlin had less chronic social defeat stress, which is relevent to depression in humans. Therefore, increased levels of gherlin may be a homeostatic adaptation to help cope with stress, however, since the hormone stimulates hunger it comes at the expense of increased calorie intake (Lutter, 2008). Neurochemistry of the brain can also be used to explain increased susceptibility to obesity as explained by the amount of pleasure enjoyed by the intake of food. A new study published in Neuroimage tested 13 women of normal weight and 13 obese women. Each, while under an MRI machine, was presented with visual food stimuli differing in calorie content. The findings of this study showed that when obese women viewed the high calorie food stimuli, they exhibited selective activation of areas in the dorsal striatum (Ruthemud, 2008). The dorsal striatum is an area in the brain that provides pleasure to animals by means of a high concentration of neurons that specialize on the release of dopamine and receptors that provide the basis for pleasure and reward in the brain. In the dorsal striatum of obese women, the regions stimulated were related to reward and habit learning providing a connection between behavior, addition, and our daily dietary intake. Further research has shown that individuals with blunted responses in the dorsal striatum are more likely to gain weight over the subsequent year. Another study published in Science tested the relation to striatal activation in response to food stimuli and future and present body mass. It was found that the dopamine receptors were more depressed in the dorsal striatum in obese individuals than those of normal weight (Stice, 2008). The MRI imaging in this study supported this hypothesis as they found that an individual’s food intake is related to the signaling from the dorsal striatum. Individuals with a hypo-functioning dorsal striatum, from morphs associated to the dopamine receptors or from environmental influences, eat more to compensate for lack of pleasure. Again, this study was further supported by a test of 77 women who tasted a chocolate milkshake. This study found that obese women experienced less pleasure from the milkshake due to a blunted dorsal striatal response. These findings all show significant data linking overeating to lack of pleasure and reward experienced in the brain. Along with previously held theories on the relationship of the brain and human behavior, these new findings will help lead into a new understanding the effects of the brain on the body. The new findings on the effects of the hormone gherlin shed more light on the brain’s coping mechanisms for stress. The studies on the dorsal striatum shed more light on the relationship between the brain’s pleasure response and portion control with food. Further studies also show that with marketing schemes, the brain can be tricked into finding more pleasure in mediocre items of food. A study showed that individuals who were told cheap wine was around $90-100 found more pleasure in the wine and its quality. More studies on the effects of the brain on obesity may help scientists and nutritionists find new methods to help decrease obesity in our society. These new studies of the brain truly show that the phrase “mind over matter” is more relevant than previously imagined.